It was after dark and the Captain called us up on deck. 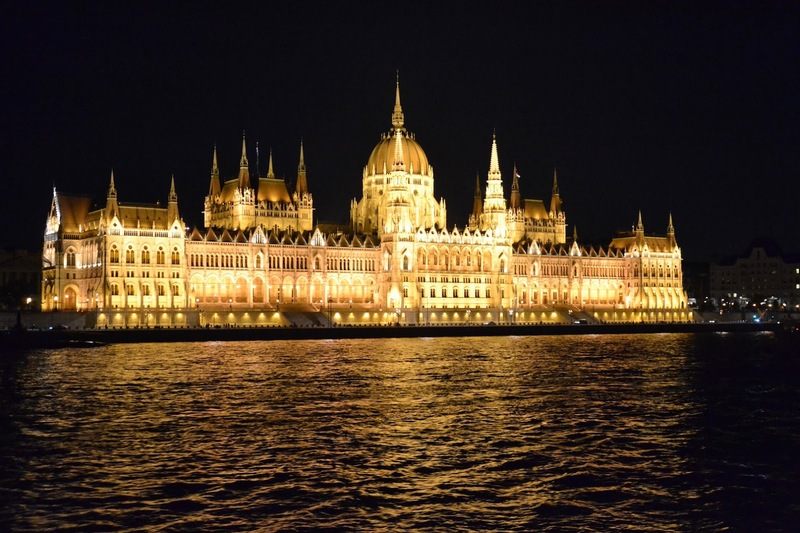 We were moored in Budapest on our last night on board and we’d been expecting this. The engines started as we climbed the stairs and the ship pulled out into the river. 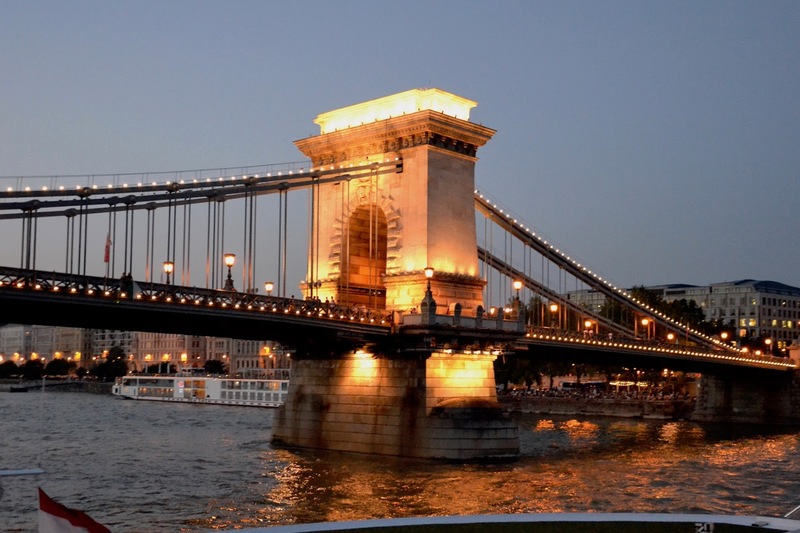 It was to be a moonlight cruise through the centre of Budapest – waiters circulated with glasses of champagne. Finally, the temperature had dropped to comfortable, from the almost 40°C (105°F) that had hobbled us all afternoon. Once again, the Hungarian Parliament building was the most anticipated, but there was a lot more to see as we took the opportunity to share memories with our cruise-mates. Earlier in the day we’d visited Castle Hill and the Roman Catholic Matthias Church. 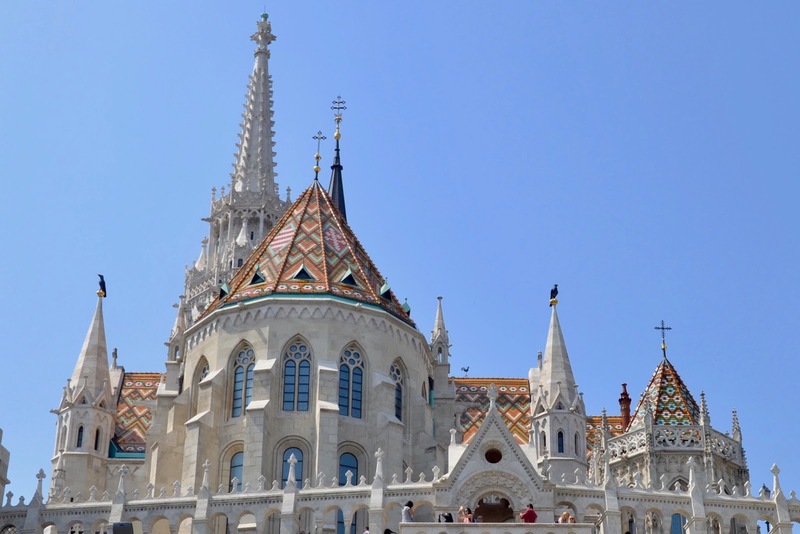 Originally built as the Church of Our Lady, when Buda was captured by the Ottoman Empire in 1541 it became the main mosque; all Christian images were covered over and replaced with arabesque patterns. The superstitious Turks couldn’t remove the Virgin Mary’s statue though, so they walled it in. 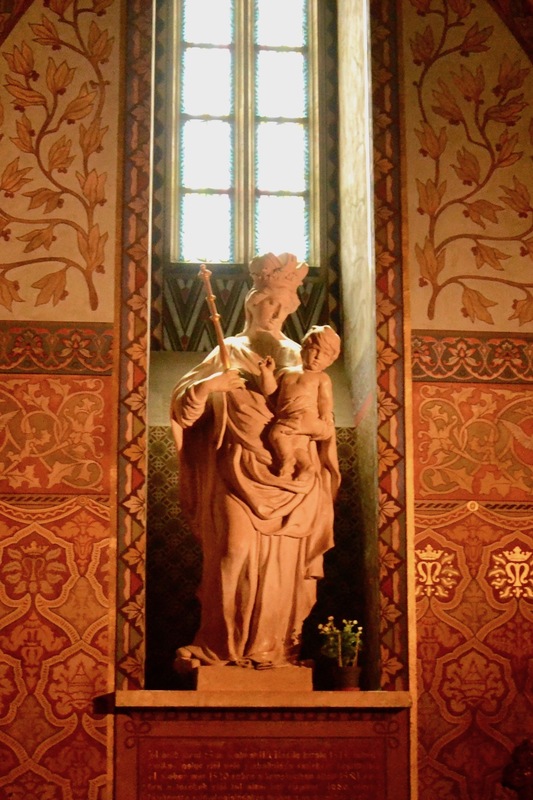 In a subsequent battle, the Holy League shelled the church during prayers and a wall collapsed to reveal her statue; the breakdown of Turkish resistance and their withdrawal is credited to this ‘Mary-wonder’, as it came to be known. 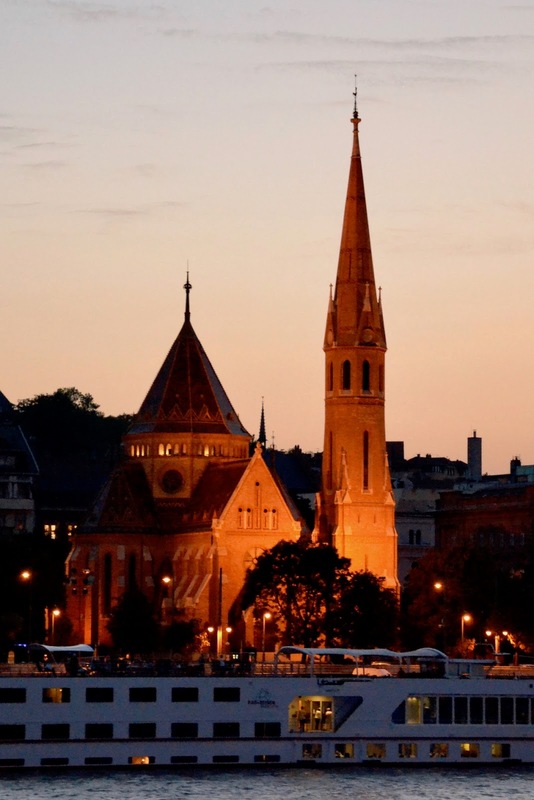 The church was rededicated to the beloved King Matthias in 19th Century. His emblem, a crow, can be seen above the church. Years ago, when we’d visited St Peter’s in Rome, I’d had to rush from the entrance to buy some ‘J-Cloth’ Vatican pants and shroud my bare legs before they’d allow me in. Here, bare legs weren’t a problem; it was women’s bare shoulders that were at issue. Volunteers stood with paper shawls ready to wrap the offending flesh. On the way we’d passed a unique church, sitting right below the Liberty Statue. 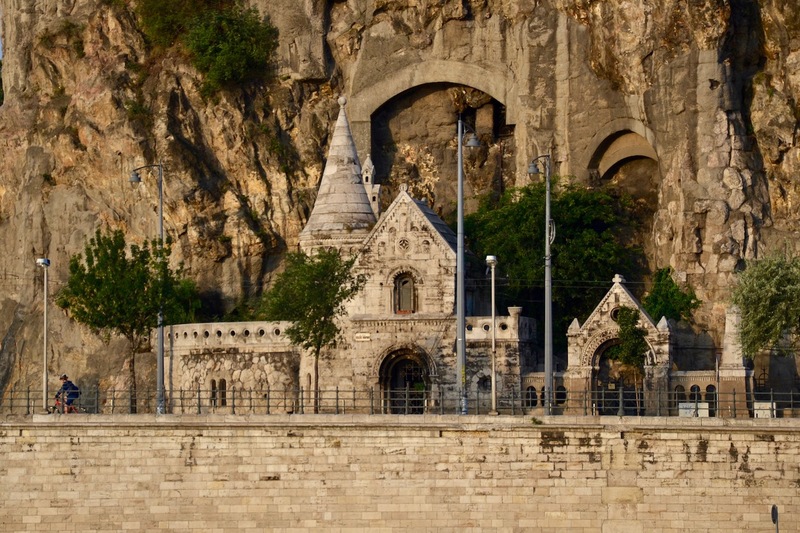 Known as the Gellért Hill Cave, monks of the Pauline order constructed this stone façade in the 1920’s and operated the caves behind it as a Catholic Chapel and monastery; in WWII the Nazis used it as a hospital. Services were held here until 1951, when the Soviets walled it up as part of their campaign against Catholicism, and sentenced the abbot to death. 40 years later the concrete was removed and the church reopened; now it forms a popular tourist attraction. Once we’d returned from the city and freshened up, a local music and dance group entertained us. 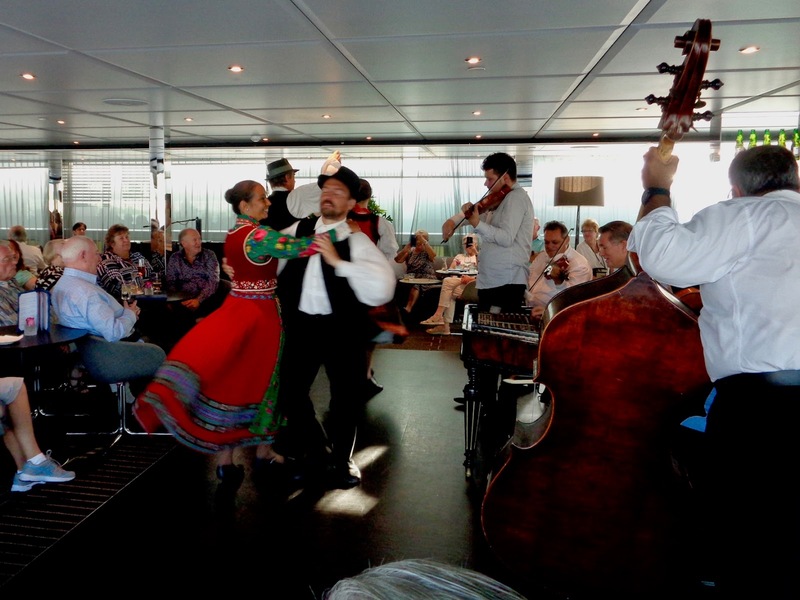 Hungarian music filled the small dance floor in the lounge. The star of the show was a cimbalom (or hammered dulcimer), a Hungarian instrument resembling a small piano with the top removed, and no keys. The dazzling medley, commencing with the Third Man Theme, rang through my head for days afterwards. 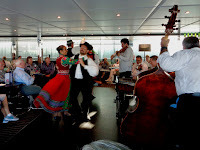 Have a listen to the Antal Szalai Gypsy Band & Georgio. Amazingly, there’s a cimbalom in the Calgary Bell Music Centre. Their performance continued with Brahms dances and more, before we had to leave for our last delicious supper below in the dining room, where we sat with friends from Chicago and Bexhill on Sea. Then it was up to the deck in the moonlight. It was the end of a lovely evening, and a lovely week, as the ship slowly passed through the city on our farewell journey, and we picked out the sights for one last time. Next day we were whisked to the airport and sent on our way – the Captain stood on the dock and thanked every passenger as we departed. But the memory of a wonderful voyage, and the new friends we made along the way, will stay with us for a long time. If you are interested in following in our wake, we sailed on the ‘Danube Delights’ Cruise with Emerald Waterways. Lots of lovely memories that you've captured in your writing and photographs. Thanks for inviting us along your journey. Thanks Susan. It was a great trip. It was a great journey and wonderful to read about it. Please let us know what your next adventure will entail. Wonderful trip accompanied by great photos. Am looking forward to your next trip!